Reserve 16 olive slices. Finely chop remaining olives. In medium bowl, combine chopped olives, cream cheese, Cheddar cheese, mayonnaise, mustard, onion powder and ground red pepper; beat until well combined. Mound mixture in center of serving plate. With flat metal spatula, shape mixture into 3-inch cube. Cover with plastic wrap; refrigerate at least 2 hours. Just before serving, spread cube with sour cream. 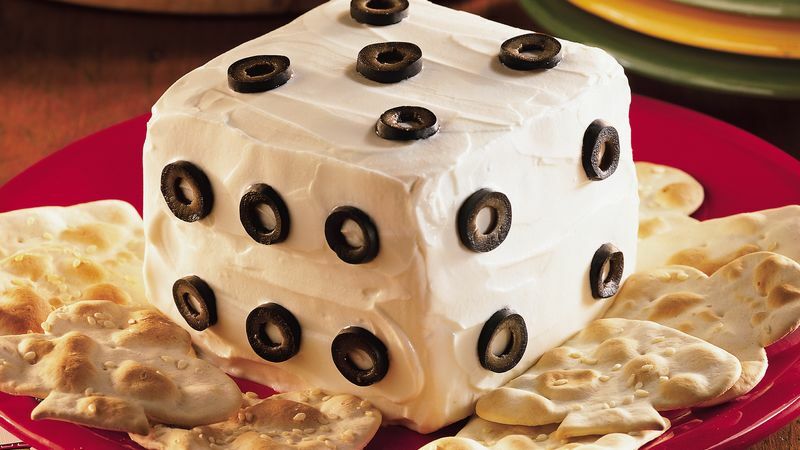 Arrange reserved olive slices on cube to resemble dice. Serve with crackers.